Dublin Mayor Micheal Mac Donncha calls for Ireland to boycott the Eurovision Song Contest in 2019 when it is held in Israel. Dublin Mayor Micheal Mac Donncha on Tuesday called for Ireland to boycott the Eurovision Song Contest in 2019. 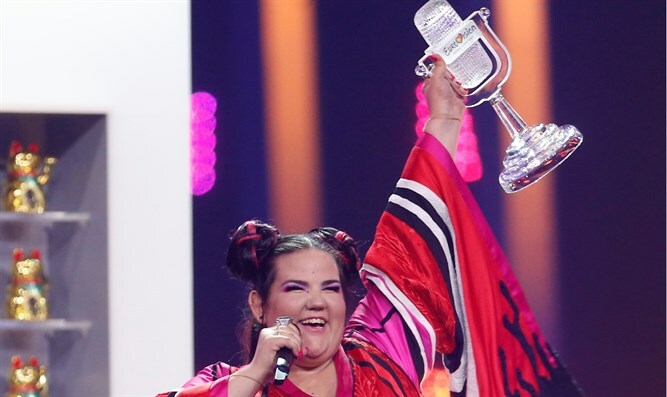 The 2019 contest will be held in Israel after Netta Barzilai won the 2018 contest this past Saturday night. Speaking to the Dublin Live news website, Mac Donncha said Ireland should show solidarity with the Palestinian people by refusing to enter next year’s contest. "I would support that, I don't think we should send a representative. I think the horrific ordeal of the Palestinian people needs to be highlighted. There needs to be solidarity just as there was with the people of South Africa with the apartheid regime," he said. "The Irish-Palestine solidarity campaign has collected the names of 500 artists who have said they would not work in the state of Israel, that they would boycott it in the protest and the treatment of the Palestinian people," continued Mac Donncha. Mac Donncha recently attended an anti-Israel conference in Ramallah. He had been banned from entering Israel following an injunction from the Interior Ministry, but had been permitted to enter Israel due to a misspelling of his name. Ireland's ambassador to Israel, Alison Kelly, was later summoned by the Israeli Foreign Ministry following the Mayor of Dublin's participation in the conference. Prime Minister Binyamin Netanyahu criticized Mac Donncha and told him, "You should be ashamed of yourself." Mac Donncha’s call for a boycott of Israel came a day after several leftist Irish lawmakers expressed support for boycotting Israel following its winning the Eurovision song contest.